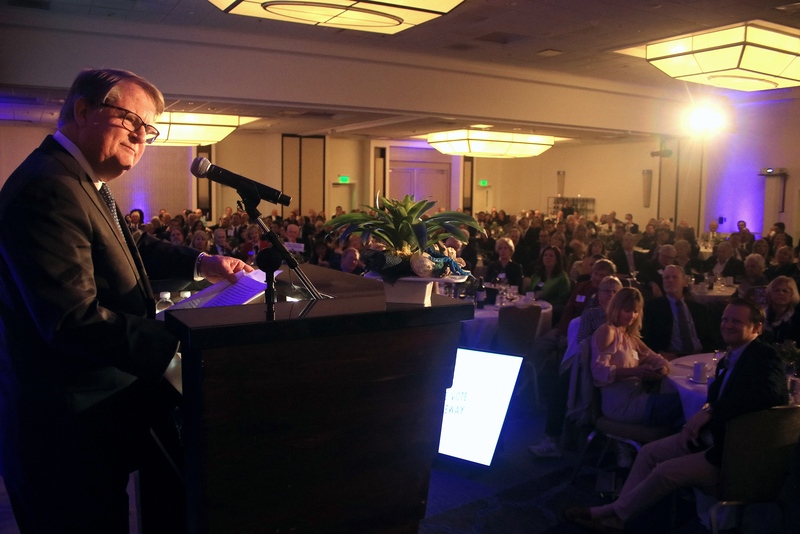 Newport Beach Mayor Marshall “Duffy” Duffield illustrated why 2018 will be the “Year of the Harbor” during an event last week. Duffield gave a “State of the City” speech at Speak Up Newport’s 37th Annual Mayor’s Dinner on Feb. 2. About 450 people attended the event at Marriott Hotel & Spa in Newport Center. His main harbor-related talking points were the city taking over management of moorings in the harbor, the harbormaster program, and dredging. A variety of users crowd the harbor on any given weekend during the busy season. They are now taking more of a “park ranger” approach, he explained. Friendly code enforcement so everyone can safely enjoy the harbor. Phase two of the harbormaster program will start after the city reworks Title 17, the city regulations for the harbor or the “bible for the bay.” He also noted that they are looking into getting a fire boat. Duffield talked about replenishing the beaches and increasing water flow through dredging. He suggested a pipe be installed under Balboa Blvd., to empty out into the ocean. When not dredging, it could bring ocean water back into the harbor, which would increase circulation. The public works department is working on the feasibility of the idea. It could be accomplished within five to six years, he added. “In the meantime, we still have 700,000 cubic yards of sediment that needs to be removed,” to get the harbor’s ideal depth, Duffield said. They are actively pursuing funds from the Army Corps of Engineers for a major dredging project, he noted. Smaller projects on an annual basis are challenging, but doable, Duffield added. “We just can’t give up,” he said. The night was full of amusing moments as well. Newport Beach Mayor Marshall “Duffy” Duffield talks with residents after the event. Duffield, who led the 2014 slate of candidates self-dubbed “Team Newport,” joked that the “real” Team Newport is city staff. He expressed gratitude for a number of employees, including City Manager Dave Kiff, who Duffield said somehow manages to keep all seven Council members happy. There were serious moments as well, as Duffield touched on a number of issues facing the city. “The financial state of our city is healthy and in good hands,” Duffield said. Once again, revenues are strong and Newport Beach ended the year with a surplus, he pointed out. Although, the trend of people buying online, instead of locally, has had an impact on the city’s revenue from sales tax. “So the city doesn’t get much of a share anymore,” Duffield said. He encouraged the audience to buy from Newport Beach shops. Duffield also revisited an idea he’s mentioned previously: Evaluating the actual usage of development projects, particularly on the waterfront or projects that replace marine-related businesses. “Is it working as designed? Or is it failing to live up to its intentions?” he questioned. He suggested requiring developers to produce a “report card” on projects. He also mentioned that Toshiba is pulling out as title sponsor of the annual golf tournament held in Newport Beach. 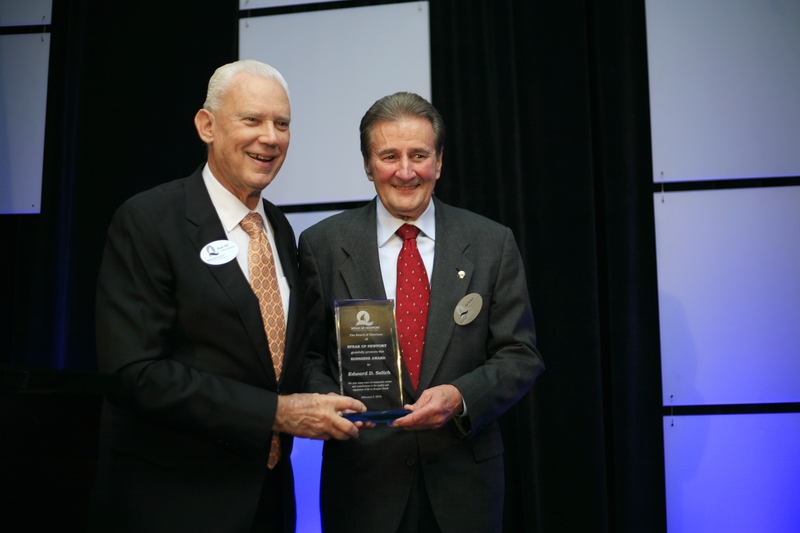 Former mayor Ed Selich (right) was honored with the annual SUNshine Award during the event. Fellow former mayor and SUN board member, Rush Hill, presented the award. The Toshiba Classic raises more than $1 million annually for Hoag Hospital Foundation and other charities, and provides exceptional national press coverage for the city, Duffield noted. The city doesn’t contribute to the event, which Duffield said “has to change.” Although last year Council members agreed to up to $15,000 in fee waivers for the 2018 tournament. 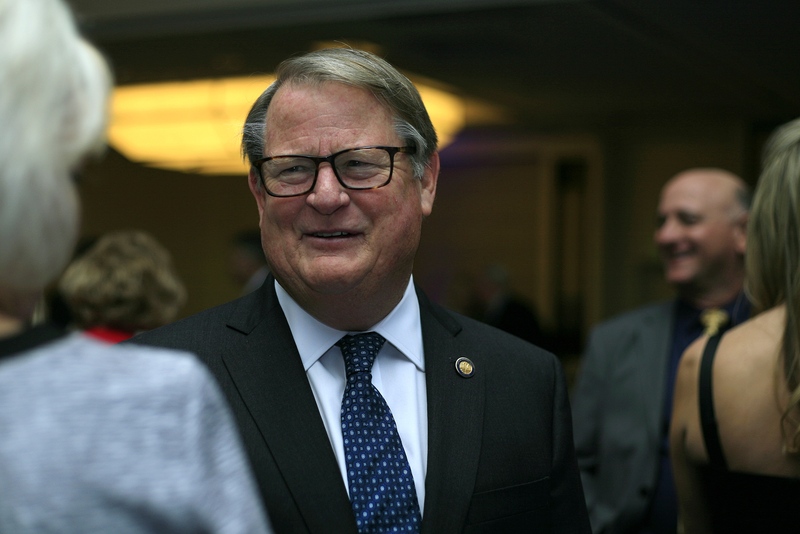 Duffield also spoke about the city‘s “practical and affordable” approach to fixing or update the seawalls, the unfunded pension, John Wayne Airport, and more. He gave a personal account about his history in Newport, learning to sail, and developing the Duffy electric boat. Also during the event, SUN officials handed out the annual SUNshine Award to former mayor Ed Selich. The award recognizes the “long-term positive impact on the community” of the recipient. Selich has helped “shape numerous elements of our quality life,” said fellow former mayor, Rush Hill, who presented the award. Selich served on many study groups, commissions, committees, and a record number of years on City Council. 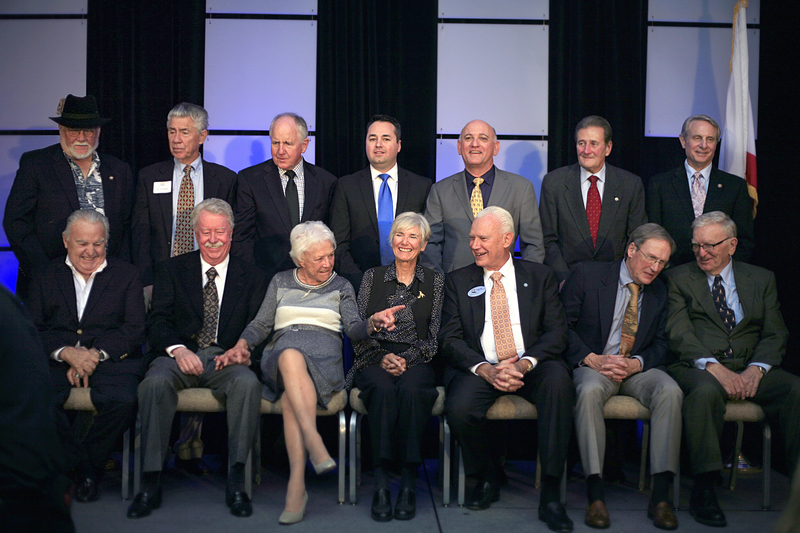 Former mayors laugh and chat as they pose for a photo during the event (left to right): (top row) Don Webb, Tod Ridgeway, John Heffernan, Kevin Muldoon, Steve Rosansky, Ed Selich, and Mike Henn; (bottom row) John Cox, John Noyes, Evelyn Hart, Nancy Gardner, Rush Hill, Tom Edwards, and Clarence Turner. The crowd cheers as current Newport Beach Mayor Marshall “Duffy” Duffield walks to the stage to give his speech. 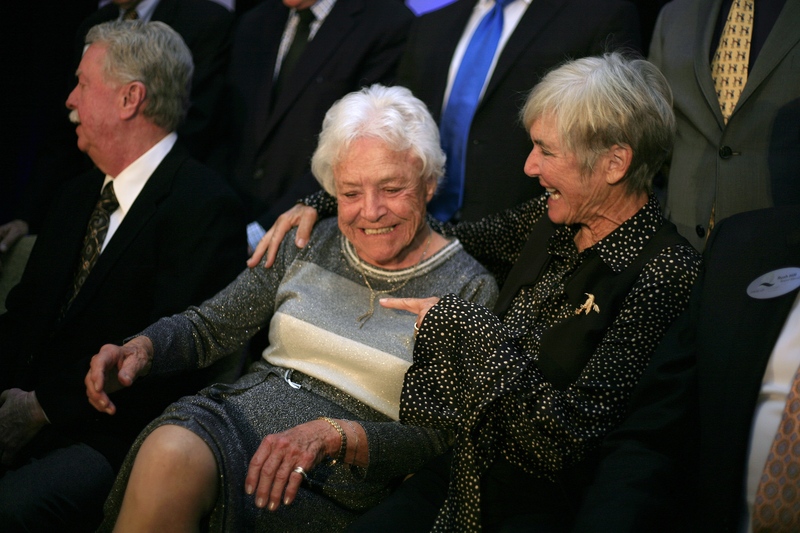 Former mayors Evelyn Hart (left) and Nancy Gardner laugh and chat as they sit down for a group photo of past mayors during the event on Feb. 2. 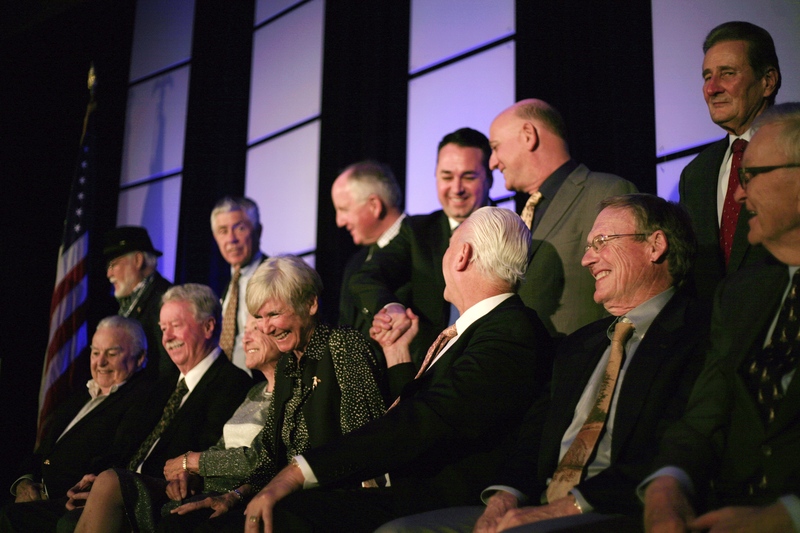 Former mayor shake hands, laugh and chat as they pose for a group photo at the event. 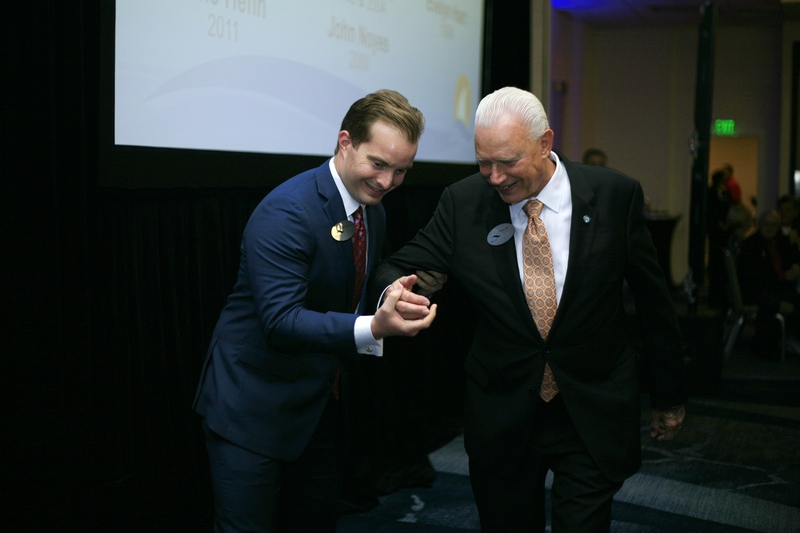 SUN board member and city Finance Committee member Joe Stapleton (left) helps former mayor and fellow SUN board member, Rush Hill to the stage. 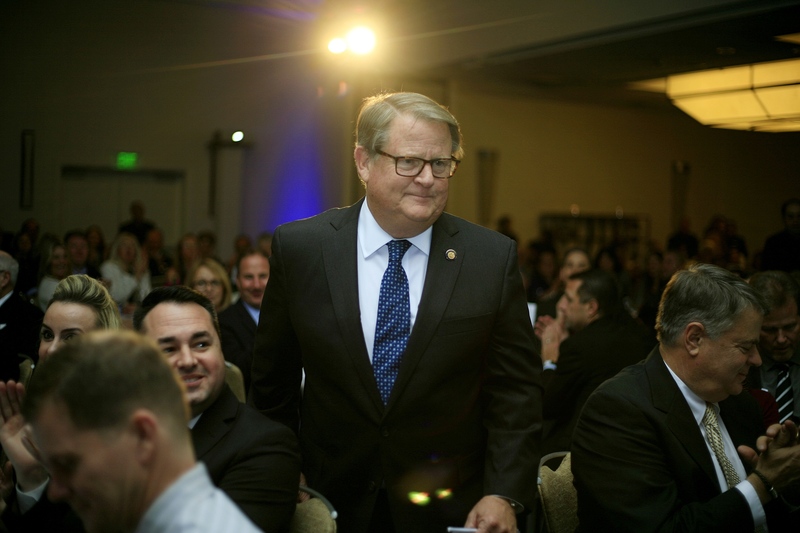 Current Newport Beach Mayor Marshall “Duffy” Duffield gives his “State of the City” address at Speak Up Newport’s 37th Annual Mayor’s Dinner on Feb. 2.